Here you will find Akiko Morigami pictures and a short bio. 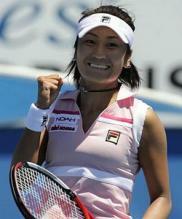 Morigami is a Japanese woman tennis player- her Japanese name is 森上亜希子. She is born on January 12, 1980 in Osaka, Japan. She stands 5'5" and weighs 118lbs. Her highest ever WTA ranking is #47.